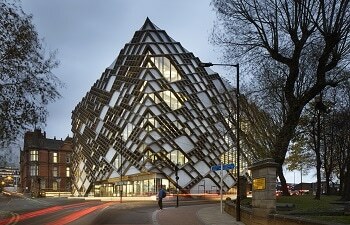 The Diamond, an £81 million pound teaching and learning facility, and the Advanced Manufacturing Research Centre (AMRC) with Boeing’s Factory 2050, one of the most advanced factories in the world, have been picked for the Royal Institute of British Architects’ (RIBA) regional shortlist. The Diamond, which opened for students in September 2015, is the University’s biggest ever investment in learning and teaching. The impressive six-storey building with a dramatic diamond shaped façade in anodised aluminium was designed by Twelve Architects. Factory2050 is the newest addition to the University’s new advanced manufacturing research campus on Sheffield Business Park. The revolutionary, glass-walled reconfigurable factory was designed by architects Bond Bryan and constructed by Interserve. The AMRC’s Integrated Manufacturing Group (IMG) is currently fitting the new building with state-of-the-art advanced technologies in robotics, automation and assembly that will drive its research. Head of IMG, Ben Morgan said: “We are thrilled to see Factory 2050 on the shortlist for this coveted RIBA award. The new building will be the home of up to 70 staff, including some very talented young engineers who will have access to some of the most advanced reconfigurable manufacturing technologies the world has to offer. RIBA’s annual awards celebrate the best architecture in the world and the University previously won an award in 2008 for the Information Commons building. The winners will be announced at a ceremony in Leeds on 21 April 2016.